MEGA-LITE introduces the new Axis Mini Grid Q9, a compact 3×3 pixel mappable eye-candy fixture with 9 RGBW 10 watt LEDs with pixel control, infinite pan and tilt as well as pre-programmed color and pixel macros for a unique eye-candy effect. The new Axis Mini Grid Q9 a smaller version of the Axis Grid, the Q9 is a compact 3×3 pixel mappable eye-candy fixture with infinite pan and tilt. It has 9 RGBW 10 watt LEDs with pixel control for a unique eye-candy effect as well as pre-programmed color and pixel macros. The Axis Mini Grid is controlled via DMX 512, it has both 3-pin and 5-pin XLR and PowerCon type in and out connectors. An LCD display allows for simple addressing and onboard control. Rigging is also made fast and easy thanks to the unit’s quick release clamp. 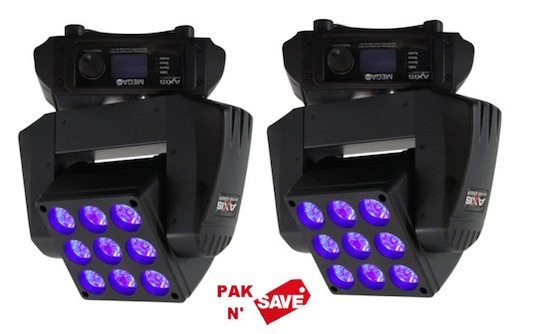 Its compact size makes the fixture ideal for multiple arrays, on stages, in clubs, mobile DJ and mobile church. DIMENSIONS(LxWxH): 13.37" x 5.88" x 13.75"